While classic poets such as Mir Taqi Mir and Mirza Ghalib of the 17th and 18th century set a benchmark, even in the modern world, Urdu, one of the principal languages of India, is alive and thriving with rich poetry, theatre, qawwali and mushaira. Every word that Gulzar, a well-known poet, lyricist and scriptwriter, speaks leaves you enchanted. While the sophistication and refinement that his lyrics or dialogues give to the Indian film industry is already recognised, his contribution to Urdu and keeping it alive is what sets him apart. However, he is quick to disagree, “Urdu is alive the same way it was earlier and it is alive with the same old strength. Its energy hasn’t reduced. Maybe its aspect is changing. This fear that Urdu is dying… Urdu is the most alive language and moving ahead with times,” contradicting conventional wisdom which says Urdu has been weakening since India’s partition in 1947. The 81-year-old poet, who is an important part of the second edition of the three-day event, Jashn-e-Rekhta, a celebration of Urdu, shared his relationship with the language in the session “Ye Kaisa Ishq Hai Urdu Zabaan Ka” (The romance of Urdu). 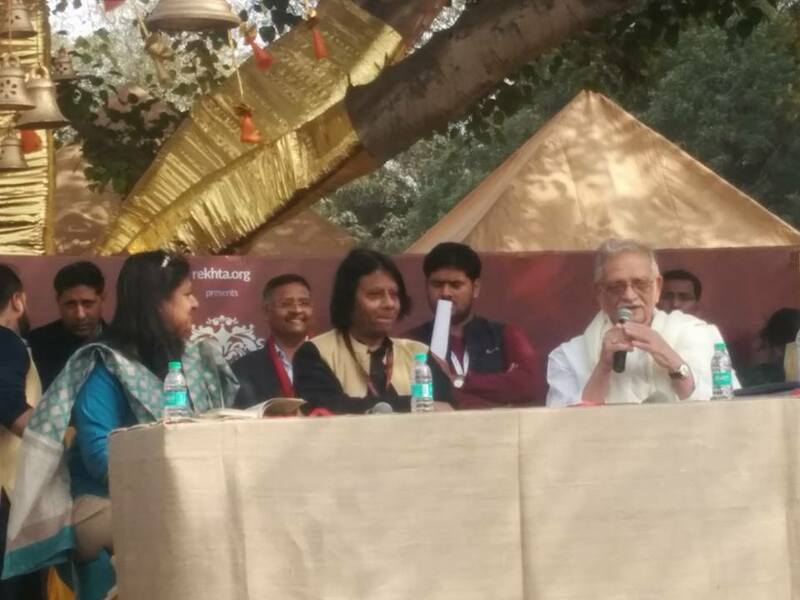 Dressed in his customary white kurta-pyjama, Gulzar always manages to charm the audience, placed in the biggest stage lawn of the venue that failed to accommodate the crowd. Referring to the audience, he says, “You can see the reach of Urdu through the number, with mostly the youth forming the audience.” However, he feels that while the language as such does not need any revival, it is the Urdu script that needs to be seen more. “Urdu is heard and spoken but the missing thing is that it is not seen much. There should be work done on Urdu scripts. More scripts in Urdu should be written as the diction is also suffering,” he says. And the fact that the poets of the twentieth century should also be celebrated and acknowledged is another concern that Gulzar puts forth. While his love and inclination towards the 18th century poet from Delhi, Mirza Ghalib, is not unknown, he says, “Although Ghalib and Mir were classic poets and form part of the Urdu heritage, we should have contemporary poets such as Faiz Ahmed Faiz in the textbooks now to show that the language has crossed the 19th century and still alive.” As Gulzar ended the session with recitals of his poems, the admirers found another way to see him again through the book launches. As the spectators waited for him patiently under the mild winter sun, at the amphitheater, picking the best seats before hand and going through several book launches before he arrived, a strange Urdu vibe instigated the surrounding. Both the audience and the moderators engaged in the recital of a series of shayari and nazms (different genres of Urdu poetry), self-written or taken from Gulzar, Ghalib or Mir, and all dedicated to Gulzar. The day two of the Urdu festival tickled the audience the right way. Among the books that were launched was “Tera Bayaan Ghalib” by Salim Arif, a well-known poet who has also worked with Gulzar in the past for translation. The day unfolded more on Ghalib through a play based on Ghalib’s letters to his friends and associates. The play, that featured noted theatre actor Tom Alter, characterised Ghalib through his letters and through the conversations between his wife Umrao Begum and their servant. Although the dialogues were a bit heavy for any amateur, the words were poetical nonetheless and kept the audience absorbed for two hours through acting and the revelations about Ghalib. Qawwali performance by Sabri brothers followed the play, once again enchanting the audience to the mystic and earthy tunes. Each of their songs brought greater depths in the air as the audience responded with a similar energy and demanded for a few of their popular pieces. Such heightened energy was further calmed by the mushaira session that put forth a few of the contemporary Indian and Pakistani Urdu poets such as Abbas Tabish, Anwar Masood and Rajesh Reddy. Looking at the upcoming Valentine’s Day, the poets notoriously were also prepared with the tips and poems for the young lovers. For amateurs, the day ended with some training on some Urdu words to flaunt, specifically their diction, a few renowned poets one must know of and an ocean of shayaris and nazms that one can immerse into.